In late October of 2017, a strong storm out of the southeast blew over hundreds of trees across Lincoln. VFF’s three Lincoln properties were impacted in varying degrees. In VFF’s Anderson Guthrie-Bancroft forestland, wind-blown tip-ups are common. 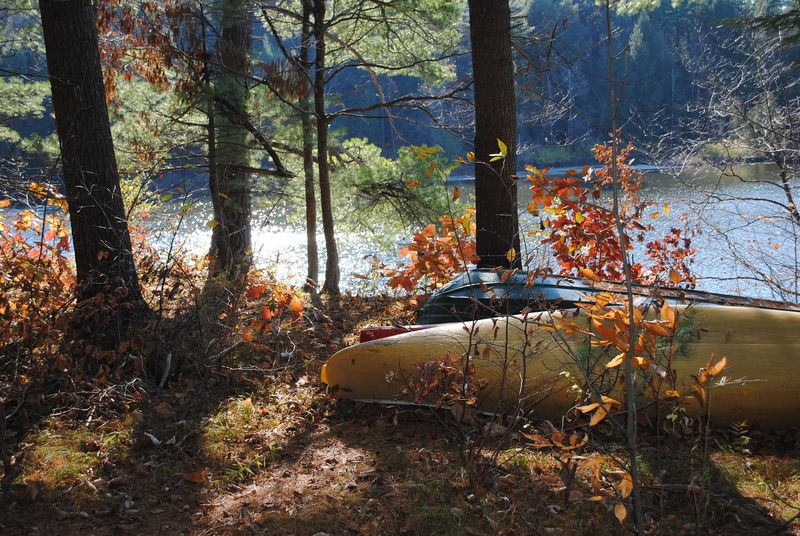 Our conservation easement with the Northeast Wilderness Trust makes it clear that there is to be minimal human interference with the processes by which our conserved Lincoln and Bristol forests renew themselves. The Town of Lincoln has cleared trees in the road right-of-way and Green Mountain power and Waitsfield and Champlain Valley Telecom has tended their transmission lines. But that was the extent of the work on our storm-impacted forests. Many of our neighbors have actively salvaged their wind-blown pines and aspens. These different approaches to dealing with storm impacts add diversity and complexity to the landscape. Yesterday, as part of our stewardship and at the invitation of our neighbors, we walked the boundary lines of a parcel where they are actively engaged in salvage. Their forester did a superb job of laying out the sale to avoid impacts to our rewilding forests. He added more pink flagging to the actual boundary and flagged a 15-foot buffer. Skid trails were flagged and the perimeters of the ¾-acre patch cuts were painted blue dots. Individual trees were marked for harvest between the patch cuts. 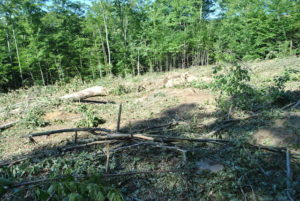 Patch-cutting removes most or all trees in a specified area. Our primary interest was that trees not be harvested on our side of the line. The operator has done a superb job of avoiding impacts. One tree on the boundary tipped over and created a huge tip-up. When the top was harvested on our neighbor’s side of the line, the remainder of the tree decided to stand back up. How all of this came to be is now quite clear. It would be fun to see what the reactions are when the tree is encountered in the future. The trip around the boundary provided an amazing opportunity to compare and contrast two different approaches to forestry – one based on forest self-renewal and the other based on forest management. Each has a role. Each has its strengths. 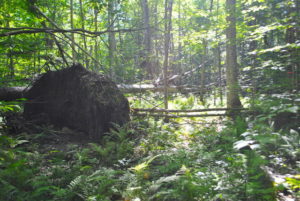 Vermont Family Forests favors leaving a lot more deadwood in the forest to rot, provide wildlife habitat, improve soil productivity, to increase infiltration and cation exchange capacities, and to slow, spread and sink storm flows. We protect and celebrate windblown trees and their tipped-up roots systems because they add complexity to the forest. We stay away from clear-cuts because they do not mimic natural disturbance very well. The downside of our approach, if there is one, is that less wood leaves the forest to feed the local economy. The bottom line is that a healthy working forest includes a triad of approaches: intensively managed forests like our neighbor’s; ecological reserves like ours; and light-on-the-land new forestry like that which we practice with our 165 VFF landowners. Managing for complexity – economic, ecological, and social – makes sense in an uncertain and rapidly-changing climate, economy, and culture. VFF is pleased to be an active part of that mix.